Wet spots underfoot? Weeping cracks in your foundation? An unexpected jump in your water bill? These can be signs of a plumbing leak. If you have a slab foundation home, you may have serious trouble. Plumbing problems can be difficult to solve when your plumbing runs beneath your home’s concrete slab foundation. Cutting through concrete, as you may imagine, adds significant time and cost to a job. There are simpler ways of repairing slab foundation plumbing problems besides blasting through the concrete base of your home. Need a plumber in Washington, D.C., Northern Virginia or Maryland right now? Schedule service online. What is a concrete slab foundation? A concrete slab foundation is constructed by pouring concrete — a mixture of gravel or broken stone, sand, cement and water — within a mold to cure. Homes with this a concrete slab foundation rest atop this rock-solid block. There is no crawlspace or basement beneath. Concrete slab foundations that encase the home's plumbing lines (also called underslab plumbing) could have pipes made of copper, cast iron or galvanized steel and these materials are prone to decay over time. The plumbing pipes are buried in gravel or sand beneath the slab and are (obviously) difficult to access. Modern homes are more likely to have a moisture barrier that protects a concrete slab. 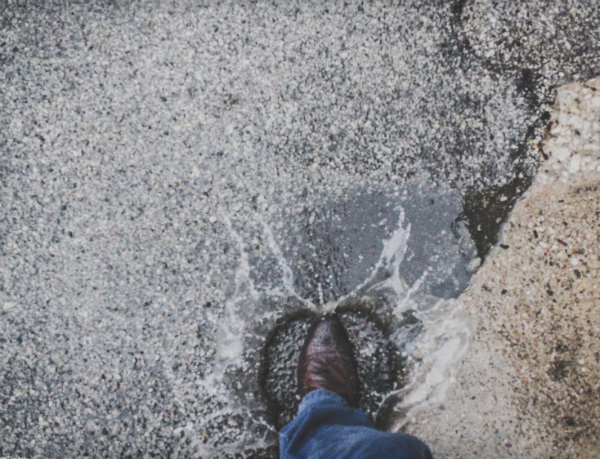 Many municipalities began to require them because a wet concrete slab foundation is unable to dry itself (your home covers the surface through which the moisture would normally evaporate) and will eventually fail. It's likely that your home does not have a moisture barrier if it was built prior to the 1980s. What are some of the red flags indicating a leak in a pipe beneath your concrete slab foundation? A leaky pipe can cause wet spots on your floor because concrete is a porous material. You may have a problem with the pipes in your concrete slab foundation if you’re walking around your home and find your socks suddenly wet from some mysterious moisture. Foul odors can result from mold growth or a breach in the sewer line and landscape damage may occur as water seeps under your yard. Cracks in your walls indicate a foundation shift that could also be the result of a leak. Find a plumber who can use leak detection devices to discover the location of the break. Pay attention! Ignoring the signs of a leak can lead to additional (and almost certainly expensive) foundation repairs. Water seeping through your foundation can create mold and mildew under your carpet or other floor coverings while attracting pests. Your nice home can be compromised quickly. Don't wait if you need a D.C. plumber. Schedule service now. If your home's plumbing is submerged beneath a concrete slab foundation, one of the best ways to avoid dealing with the problem twice is by rerouting your piping around the slab. Again, accessing pipes and repairing plumbing in a concrete slab foundation can make for a complex, messy and time-consuming project that involves a jackhammer or a concrete saw, or at least drilling holes in your foundation. The project can be done — just expect to pay for the labor. A professional plumber can isolate the leaky area and reposition your pipes in a more accessible location behind your home’s walls or ceilings if you decide to reroute your pipes. You have some options, like trenchless repair, when your leak is beneath your yard.